Product information "Strickschal double duchess/raspberry"
We believe we have found a contender for the perfect winter scarf. Our Double features 340 grams of pure cashmere wool and is therefore guaranteed to keep you warm – even in the depths of winter. 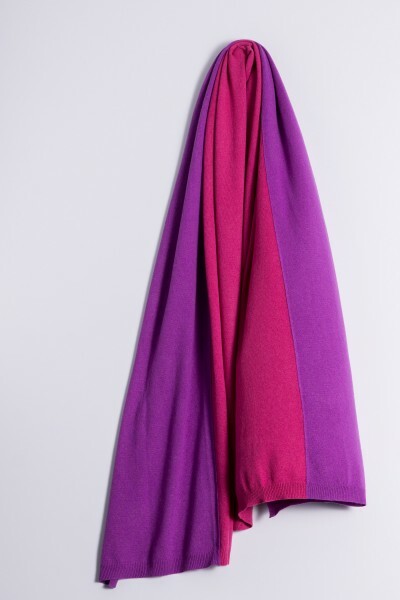 The fluffy wool of the two-coloured scarf gives the solid knit structure a soft feel. The generous dimensions (70 × 200 cm) ensure optimum comfort. It does not itch; you only experience the particular warmth of cashmere. The combination of colours and translucent tones creates an exciting layered effect when it is worn. You will thus be able to make it through the winter in style. Related links to "Strickschal double duchess/raspberry"